The Mediterranean Sea, a sea of the Atlantic Ocean, lies between the continents of Eurasia and Africa enclosed almost completely by land. It is bounded on the north by Europe, on the south by Africa, and on the east by Asia; and it joins with the Atlantic Ocean through the Strait of Gibraltar only eight miles (13 kilometers) wide and 1,050 feet (320 meters) deep. 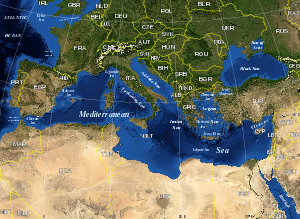 The surface area of the Mediterranean Sea is approximately 965,000 square miles (2.5 million square kilometers). 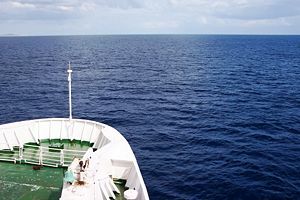 In oceanography, the Mediterranean Sea is sometimes called the Eurafrican Mediterranean Sea or the European Mediterranean Sea, to distinguish it from mediterranean seas elsewhere. To the northeast the Mediterranean Sea is connected with the Black Sea through the Dardanelles (with a sill depth of 230 feet), the Sea of Marmara, which is often considered to be part of the Mediterranean Sea, and the strait of the Bosporus (sill depth of about three hundred feet). 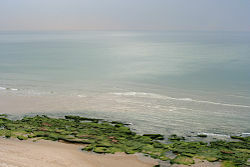 To the southeast it is connected with the Red Sea by the man-made Suez Canal. Historically, the warm and temperate climate of the Mediterranean Sea region allowed numerous ancient peoples to establish themselves and flourish, developing traditions of philosophy, art, literature, and medicine which lie at the roots of modern Western and Middle Eastern culture. For the entire region, the Sea itself was the most important route for merchants and travelers of ancient times, allowing for trade and cultural exchange between emergent peoples of the region—the Mesopotamian, Egyptian, Semitic, Persian, Phoenician, Carthaginian, Greek and Roman cultures. Knowledge of the history of the Mediterranean is crucial to understanding the origins and development of many modern societies. In the past few centuries, human activity has brought about irreversible changes in the ecology and geology of the Mediterranean Sea. Bordered by more than 20 countries and territories depending on it as a crucial part of their economy, the Sea is strategically positioned to serve as a test ground for developing strategies of multinational collaboration in exploiting and managing a shared aquatic resource. The term Mediterranean derives from the Latin mediterraneus, “inland” (medius, “middle” + terra, “land, earth”). To the ancient Romans, the Mediterranean was the center of the Earth as they knew it. The Mediterranean Sea has been known by a number of alternative names throughout human history. It was, for example, commonly called Mare Nostrum (Latin, “Our Sea”), and occasionally Mare Internum by the Romans (Sallust, Jug. 17). The Greeks named it Mesogeios (Μεσόγειος), meaning inland, interior (μεσο, “middle” + γαιος, “land, earth”). In the Old Testament, on the west coast of the Holy Land, and therefore behind a person facing the east, it is called the "Hinder Sea," sometimes translated as "Western Sea," (Deut. 6:24; Joel 2:20), and also the "Sea of the Philistines" (Exod. 12:81), because that people occupied a large portion of its shores near the Israelites. Mostly, however, it was the "Great Sea" (Num. 34:6, 7; Josh. 1:4, 9:1, 15:47; Ezek. 47:10, 15, 20), or simply "The Sea" (1 Kings 5:9). In Hebrew, it is called HaYam HaTikhon (הַיָּם הַתִּיכוֹן), "the middle sea," a literal adaptation of the German equivalent Mittelmeer. In Turkish, it is Akdeniz, "the white sea." In Arabic, it is Al-Baħr Al-Abyad Al-Muttawasit (البحر الأبيض المتوسط), "the middle white sea." The character of the Mediterranean Sea is determined by the fact that it is nearly landlocked. As a result of the narrow connection with the Atlantic Ocean, tides are very limited. The Mediterranean is characterized by its imposing deep blue color, especially around the Greek islands. Evaporation greatly exceeds precipitation and river runoff in the Mediterranean, affecting the water circulation within the basin. The quantity of fresh water flowing into the Mediterranean from rivers is only one-third of the amount lost through evaporation. Evaporation is especially high in its eastern half, causing the water level to decrease and salinity to increase eastward. This imbalance causes a pressure gradient which draws relatively cool, low-salinity water from the Atlantic across the basin; it warms and becomes saltier as it travels east, then sinks in the region of the Levant and circulates westward, to spill over the Strait of Gibraltar. Thus, seawater flow is eastward in the strait's surface waters, and westward below; once in the open ocean, this chemically-distinct "Mediterranean Intermediate Water" can persist thousands of kilometers away from its source. Salinity in the surface waters of the Mediterranean is about 38 parts per thousand, except in the area closest to the Atlantic, and approaches 40 parts per thousand in the eastern Mediterranean during the summer. Salinity of the deep water is about 38.4 parts per thousand. The Mediterranean has three layers of water masses; a surface layer, an intermediate layer, and a deep layer that sinks to the bottom. Measurements of the rate at which the deep layer forms and sinks, and studies of heat and water exchange in the Mediterranean provide useful models for understanding the impact of global climactic change on the world’s oceans. 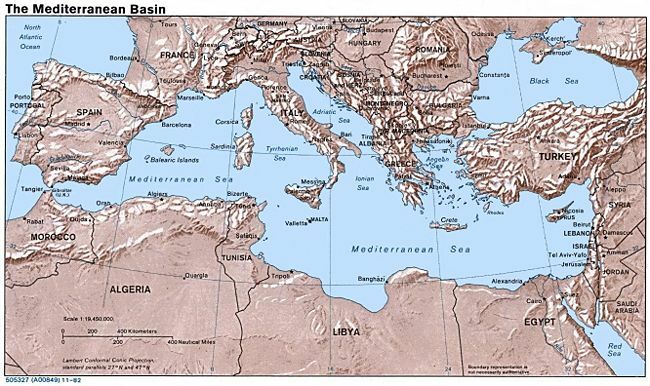 Water on the surface of the Mediterranean circulates in separate counterclockwise movements in each of the two basins. The complexity of the northern coastline and the numerous islands cause many eddies and local currents. Tides, although their range is significant only in the Gulf of Gabes and the northern Adriatic, complicate the currents in narrow channels such as the Strait of Messina. Areas of the Mediterranean closer to the equator are hotter in temperature. The Gulf of Sidra, off the coast of Libya, has the highest water temperatures of about 88 °F (31°C) in August, followed by the Gulf of Iskenderun with 86°F (30°C). The extreme north of the Adriatic has the lowest surface temperatures; the mean temperature in February falls to 41°F (5°C) in the Gulf of Trieste, and ice occasionally forms in winter. Macedonia, Portugal, San Marino, Serbia, and the Vatican, although they do not border the sea, are often considered Mediterranean countries in a wider sense due to their Mediterranean climate, fauna and flora, and their cultural affinity with other Mediterranean countries. The geology of the Mediterranean is complex, involving the break-up and then collision of the African and Eurasian tectonic plates, and the Messinian Salinity Crisis in the late Miocene when the Mediterranean dried up. The Mediterranean Sea has an average depth of 4,920 feet (1,500 meters) and the deepest recorded point is 17,280 feet (5,267 meters) in the Calypso Deep in the Ionian Sea. The coastline extends for 27,600 miles (46,000 kilometers). A shallow submarine ridge underlying the Strait of Sicily, which separates the island of Sicily and the coast of Tunisia, divides the sea in two main subregions, the Western Mediterranean and the Eastern Mediterranean. The Western Mediterranean covers an area of about 328,100 square miles (850,000 square kilometers) and the Eastern Mediterranean about 637,000 square miles (1.65 million square kilometers). The western section has three submarine basins, the Alborán, the Algerian, and the Tyrrhenian basins (from west to east), divided from one another by submerged ridges. The eastern section is made up of the Ionian Basin (northwest of which is the Adriatic Sea) and the Levantine Basin (northwest of which is the Aegean Sea). The Mediterranean was once thought to be the remnant of the Tethys Ocean. Studies conducted since the 1970s, however, have suggested that the present Mediterranean seafloor is not part of the older (200 million years) Tethys floor. It is now known to be a structurally younger ocean basin (44 million years) known as Neotethys. Neotethys formed during the Late Triassic and Early Jurassic rifting of the African and Eurasian plates. The geodynamic evolution of the Mediterranean Sea was driven by the convergence of European and African plates. Geologic data suggests that there are at least six main areas where the Africa and Eurasian plates collide, resulting in volcanism, mountain building, and land submergence. The Mediterranean also hosts wide extensional basins and migrating tectonic arcs, in response to its land-locked configuration. Eastern Mediterranean: in middle Miocene times roughly 20 million years ago, the collision between the Arabian microplate and Eurasia led to the separation between the Tethys and the Indian Ocean. This process brought about profound changes in the oceanic circulation patterns, which shifted global climates toward colder conditions. Since that collision, the Hellenic Arc, which has a land-locked configuration, underwent a widespread extension. During the Pleistocene, the Hellenic Arc experienced a rapid rotation phase, with a counterclockwise component in its eastern portion and a clockwise trend in the western segment. Central Mediterranean: over the last thirty million years, trench migration and the opening of back arcs caused the formation of the small oceanic basins of the central Mediterranean. This phase was characterized by the counter-clockwise rotation of the Corsica-Sardinia block, which lasted until the Langhian (c. 16 million years ago), and was followed by a slab detachment along the northern African margin. Subsequently, a shift of this active extensional deformation led to the opening of the Tyrrenian basin. Western Mediterranean: Since the Mesozoic, during convergence between Africa and Iberia in the western Mediterranean developed the Betic-Rif mountain belts. The tectonic model for its evolution includes rapid movement of the Alboran microplate subduction zone and radial extensional collapse, caused by convective removal of lithospheric mantle. The development of these intramontane Betic and Rif basins led to the onset of two marine gateways which were progressively closed during the late Miocene by an interplay of tectonic and glacio-eustatic processes. Because of its peculiar latitudinal position and its land-locked configuration, the Mediterranean is especially sensitive to astronomically-induced climatic variations, which are well documented in its sedimentary record. During dry periods, eolian dust blown from the Sahara Desert is deposited in the Mediterranean, while deposits of detrital mud washed in by rivers prevail during wet periods. Because of this, geological studies of the layers of rock under the Mediterranean which bear marine sapropel (dark-colored sediments containing organic matter) provide us with high-resolution climatic information for the time periods when those sediments were deposited. These data have been employed in reconstructing astronomically calibrated time scales for the last nine million years of Earth’s history. The exceptional accuracy of these paleoclimatic records has improved our knowledge on the Earth’s orbital variations in the past. The semi-enclosed configuration of the Mediterranean Sea makes the oceanic gateways critical in controlling circulation and environmental evolution. Water circulation patterns are driven by a number of interactive factors, such as climate and the sea floor terrain, which can lead to precipitation of evaporites. During late Miocene times, a so-called “Messinian Salinity Crisis” occurred, which was triggered by the closure of the Atlantic gateway. Evaporites accumulated in the Red Sea Basin (late Miocene), in the Carpattian foredeep (middle Miocene) and in the whole Mediterranean area (Messinian). An accurate age estimate of the Messinian Salinity Crisis (5.96 million years ago) has recently been astronomically achieved; furthermore, this event seems to have occurred synchronously. The Messinian Salinity Crisis is presumed to have been triggered by tectonic action; however an astronomical influence (eccentricity) might also have been involved. In the Mediterranean basin, diatomites are regularly found underneath the evaporitic deposits, suggesting a connection between their geneses. 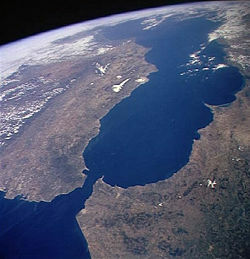 The present-day Atlantic gateway, the Strait of Gibraltar, originated in the early Pliocene. In the past there were two other connections between the Atlantic Ocean and the Mediterranean Sea, the Betic Corridor (southern Spain) and the Rifian Corridor (northern Morocco). The former closed during Tortonian times, provoking a “Tortonian Salinity Crisis” long before the before the Messinian Salinity Crisis. The Rifian Corridor closed about six million years ago, allowing exchanges of mammal species between Africa and Europe. The drying of the sea during the Messinian Salinity Crisis eliminated most of the marine life of that period, and the current marine biota of the Mediterranean are derived primarily from the Atlantic Ocean. The North Atlantic is considerably colder and more nutrient-rich than the Mediterranean, and the marine life of the Mediterranean has had to adapt to its differing conditions in the five million years since the basin was reflooded. In the last few centuries, humankind has altered Mediterranean geology by digging canals, re-routing rivers and building structures all along the coastlines, exacerbating and changing erosional patterns. Historically, large seasonal inflows from the Nile, which reduced the salinity of coastal waters, were part of an essential cycle influencing the hydrology and the productivity of the fisheries of the southeastern part of the Mediterranean. The construction of the Aswan High Dam in 1970 put an end to this seasonal fluctuation of the Nile's discharge into the Mediterranean. Mismanagement of beaches and overuse of the sea's natural and marine resources continue to be a problem. Industrial pollution and chemical pollution from boats is another threat. Recently the amount of raw sewage being dumped directly into the Mediterranean every year has reached over one million tons. Many marine species have almost disappeared, such as the Mediterranean monk seal, which has been identified as one of the top ten endangered species in the world. The opening of the Suez Canal in 1869 created the first saltwater passage between the Mediterranean and Red seas. The Red Sea is higher than the Eastern Mediterranean, so the canal serves as a tidal strait that pours Red Sea water into the Mediterranean. The Bitter Lakes, which are hypersaline natural lakes that form part of the canal, blocked the migration of Red Sea species into the Mediterranean for many decades, but as the salinity of the lakes gradually equalized with that of the Red Sea, the barrier to migration was removed, and plants and animals from the Red Sea have begun to colonize the eastern Mediterranean. The Red Sea is generally saltier and more nutrient-poor than the Atlantic, so the Red Sea species have advantages over Atlantic species in the salty and nutrient-poor Eastern Mediterranean. Accordingly, Red Sea species invade the Mediterranean biota, and not vice versa; this phenomenon is known as the Lessepsian migration (after Ferdinand de Lesseps, the French engineer) or Erythrean invasion. The construction of the Aswan High Dam across the Nile River in the 1960s reduced the inflow of freshwater and nutrient-rich silt from the Nile into the eastern Mediterranean, making conditions there even more like the Red Sea, and worsening the impact of the invasive species. Species from the Red Sea that have invaded the Mediterranean through the Suez canal have become a major harmful component of the Mediterranean ecosystem endangering many local and endemic Mediterranean species. About 300 species native to the Red Sea have already been identified in the Mediterranean Sea, and there are probably others yet unidentified. In recent years, the Egyptian government's announcement of its intentions to deepen and widen the canal, have raised concerns from marine biologists, fearing that this will worsen the invasion of Red Sea species into the Mediterranean by facilitating the crossing of the canal for additional species. ↑ Henry George Liddell and Robert Scott. A Greek-English Lexicon. “μεσόγαιος.”. Retrieved August 21, 2007. ↑ Paul R. Pinet. Invitation to Oceanography. (Saint Paul, MN: West Publishing Co., 1996, ISBN 0314063390), 202. ↑ B. S. Galil and A. Zenetos, “A sea change: exotics in the eastern Mediterranean Sea,” in E. Leppäkoski, et al., Invasive Aquatic Species of Europe: Distribution, Impacts and Management. (2002), 325-336. Westbrook, Graham K., and T. J. Reston. 2002. “The Accretionary Complex of the Mediteranean Ridge: Tectonics, Fluid Flow and the Formation of Brine Lakes.” Marine Geology 186: 1-2. Amsterdam: Elsevier. This page was last modified on 8 July 2013, at 14:52.